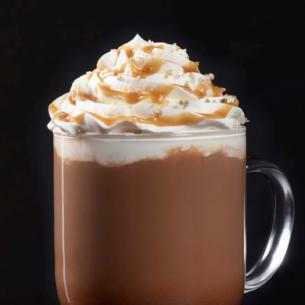 Mocha sauce and toffee nut syrup are combined with coffee and milk, then topped with sweetened whipped cream, caramel drizzle and a blend of turbinado sugar and sea salt. Enjoy the flavors of fall in every sip. Milk, Mocha Sauce [Water, Sugar, Cocoa Processed With Alkali, Natural Flavor], Brewed Espresso, Toffee Nut Syrup [Sugar, Water, Natural Flavor, Salt, Sodium Benzoate, Citric Acid], Whipped Cream [Cream (Cream, Mono And Diglycerides, Carageenan), Vanilla Syrup (Sugar, Water, Natural Flavors, Potassium Sorbate, Citric Acid)], Caramel Sauce [Sugar, Corn Syrup, Butter (Cream [Milk], Salt), Water, Heavy Cream, Nonfat Dry Milk, Natural Flavors, Salt, Mono & Diglycerides, Soy Lecithin, Sulfites], Sea Salt Topping [Turbinado Sugar, Smoked Sea Salt, Less Than 2% Silicon Dioxide].